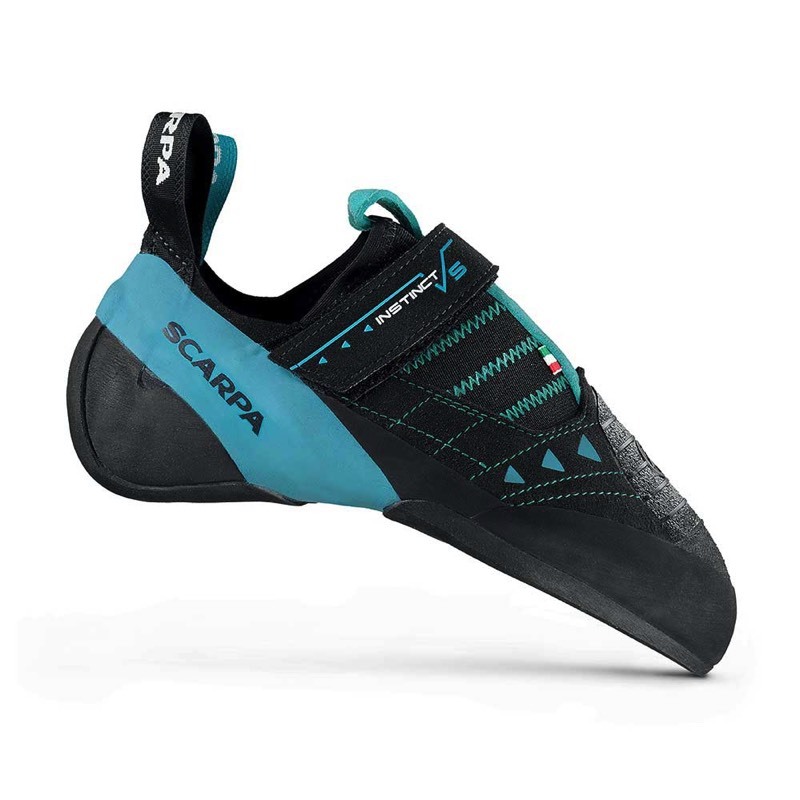 When it was introduced a few years ago, the original Scarpa Instinct VS was widely recognized as a great high-performance shoe that excelled on small holds without sacrificing the sensitivity necessary for steeper routes or more friction oriented climbing. 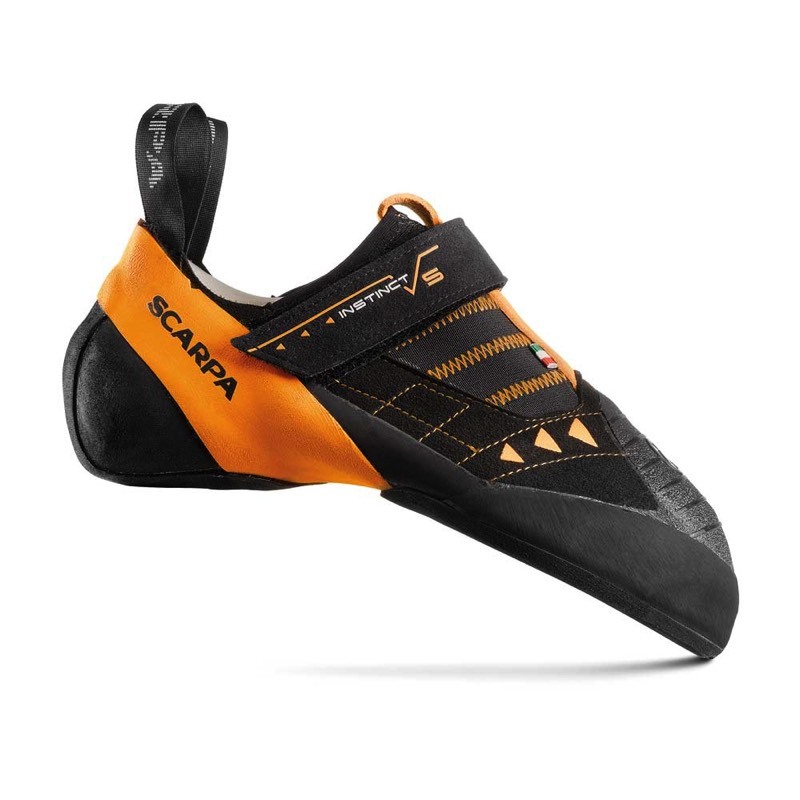 As such, it quickly became a popular option for climbers training and competing on plastic (it’s been Alex Puccio’s go-to shoe for some time) and also looking to send their outdoor projects. Yet even with such widespread success, there were still a few climbers that wished that the Instinct VS was softer and more biased towards steeper routes and plastic. It seems that Scarpa has been paying attention to these requests. This season, Scarpa has released the new Instinct VSR. Except for the blue accents (the Instinct VS has orange accents), the new VSR is almost identical to the original Instinct. I say almost because the VSR has a slightly softer midsole as well as softer Vibram SX Grip rubber. These two differences firmly position the Instinct VSR as the better option for plastic or steep routes. The other less obvious win is that the new Instinct VSR is now also more suitable for lighter climbers (Scarpa suggests climbers weighing 140 pounds or less). This last point is interesting because Scarpa is acknowledging that the climber’s weight influences the performance of climbing shoes. 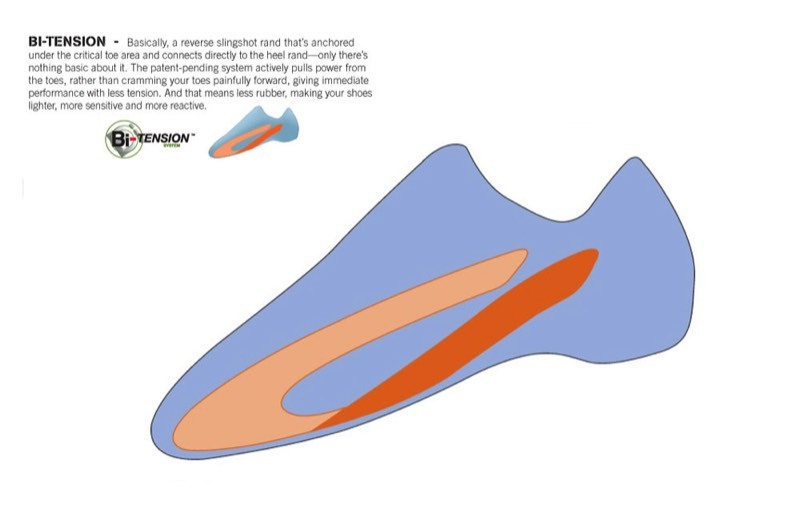 A shoe that might feel flexible and sensitive for a 200-pound climber with size 12 feet will feel like a plank for a 100-pound junior team member. With the explosive growth in youth climbing, it’s nice to see climbing shoes that are suitable for these lighter athletes. Ok, enough with the theory. Let’s get into how the new Instinct VSR performs. As I’ve said earlier, this shoe is almost identical to the original Instinct; it uses the same mildly downturned and not aggressively asymmetric last as well as Scarpa's patented Bi-Tension system that adds power to the forefoot without a foot-crushing fit. So it’s not surprising that the VSR performs, well, a lot like the VS.
Where it differentiates itself from the original VS is on steeper terrain. Here, the softer rubber and midsole allow for easier and more secure pulling as well as improved sensitivity. This increased feedback is also useful on the slabby hyper-technical volume climbing that is currently in vogue in comps. As for toe and heel hooking, the VSR is superb. The front of the shoe showcases a large patch of textured rubber that can easily dispatch even the most tenuous toe hooks. For the heel, Scarpa employs a medium volume fit and a relatively soft and simple-looking construction. This innocuous combination delivers a surprisingly high level of security even when hooking subtle features. I suspect this level of heel-hooking performance is also partially due to the position of the Velcro strap closure and the tensioned rand; these two components help lock the heel in place and minimize any shifting inside the shoe when heel-hooking. For edging and smearing, the shoe performs as expected; it edges admirably (although heavier climbers will prefer the performance of the slightly stiffer original orange Instinct), and thanks to its softer construction and stickier rubber, it smears and pulls more effectively on subtle features and steep ground. 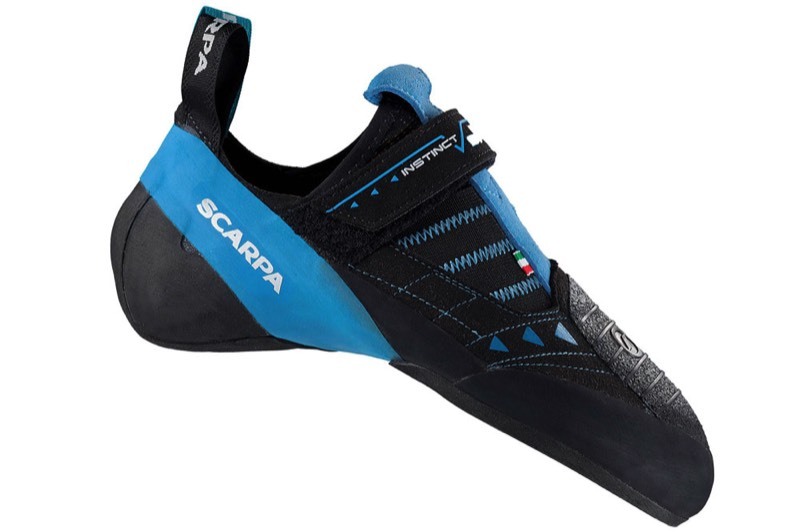 Construction quality is, as usual, top-notch – Scarpa knows how to build shoes. If you’re getting the sense that I really like these shoes, you’re right. But there is one small detail that some climbers should note. The sleeve/elasticized opening is somewhat snug, and climbers with high foot arches may have to work a bit harder to get into the shoe. This is by no means a deal-breaker, but it is something worth remembering when initially trying on the shoes. Outside of this one quibble, I could not find any issues with the new Instinct VSR. For me, (as a lighter climber) it performed at least as well as the original Instinct on vertical terrain and was notably superior on steeper ground and plastic. If you are a lighter climber (youth team members take note) or are just looking for a softer and more sensitive shoe for the gym, hard bouldering and steeper climbs, the Instinct VSR should be at the top of your list. 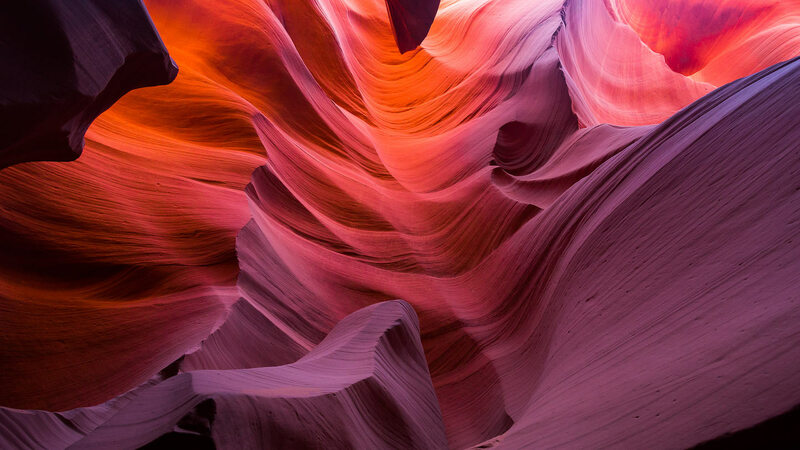 Gus Alexandropoulos is a freelance writer who has been involved in the outdoor industry for over 25 years. During his career he has been the editor at Canada’s national climbing magazine, as well as the gear editor for a national cycling magazine, triathlon magazine and running magazine. His work has been published in Canada’s national newspaper, The Globe and Mail, and he has been a guest on television and radio broadcasts. His passion for climbing began in Ontario in the mid 80s and he continues to travel extensively in search of crisp conditions and steep rock.